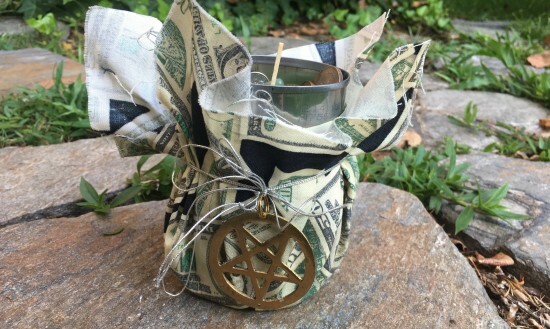 During this harvest season, I would like to share with you a “Money Pot” spell, that brings wealth and abundance into our lives. While Southern Conjure is a form of folk magick that I have the most yet to discover, I’ve found over the years that these traditional spells are some of the most creative, and yet down-to-earth spells, you can enact. I appreciate this form of folk magick that is so inherently tied to this “neck of the woods” where I’m from. For me, they work like a charm! The idea of a “Money Pot” was first introduced to me by Orion Foxwood (1), when he taught workshops here at our local Samhain festival in 2012. Later, I was privileged to work with him further at an intensive training weekend, where he took us into deeper detail about the culture of Appalachian Conjure and Root Work techniques. Now, I make good use of these techniques in just about every magickal working I do. My money pot has now been a part of my altar for 4 years, and through meandering trial, error, and research it has grown to become a reflection of my unique path and relationship with the Powers. A money pot, like a mojo hand, or any other talisman one nurtures over time, becomes radically personal, and should not be touched or tampered with by anyone other than it’s owner. I encourage you to “field test” this experiment for yourselves. Start with the basic recipe, but get to know each player for yourself. Feel it, develop a relationship with each spark of consciousness within, and know exactly which powers you are awakening and calling to your aid. Then trust your guts as you evolve the working over time for your own needs. I’m an eclectic, so I have no problem blending what I know from across traditions, so long as I approach both the Spirit within, and the culture, with knowledge and respect. You do what feels right for you. Click here to continue over to Witch on Fire for the complete directions.